The Chateau Fuente Pyramid by Arturo Fuente represents the ultimate smoking experience in both taste and appearance. It is blended using the finest aged Dominican filler and binder and covered by a golden Connecticut Shade wrapper. It is a mild to medium smoke which boasts a nutty core and subtle hints of cedar, spice, and caramel. A true gem of a cigar! 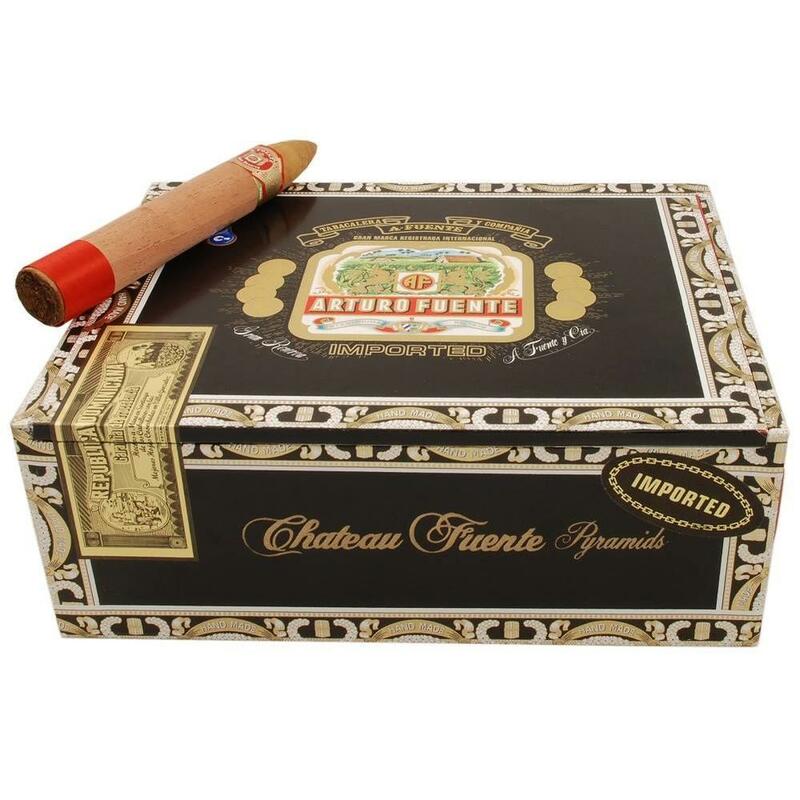 Introduced in 2009, the stylish Chateau Fuente Pyramid by Arturo Fuente is presented in a golden brown Connecticut Shade wrapper and aged Fuente private reserve Dominican filler and binder. The mellow to medium smoke is nutty with hints of honey and cedar. The wrapper provides faint flavors of chocolate and figs. Always find this premium cigar for sale online at a great price from elcigarshop.com. Imagine a warm snifter of finely age cognac and a precisely aged cigar sitting before a fire. The pairing of cognac and cigars is synonymous with sophistication. When you consider a spirit to match perfectly with your cigar, cognac is an obvious choice. The classic pairing has been the preferred drink for centuries. Cognac is a grape-based brandy specific to the Cognac region in France. Some very nice cognacs come from western France. When you wed your cigar to cognac keep in mind of the body of your smoke and the brandy itself. Flavors common to both will enhance the flavors of the smoke and drink providing the most out of your experience. With notes of plum and chocolate, Remy Martin Royal Accord 1738 pairs nicely with the flavors of the Chateau Fuente Pyramid. There is a present trend among young chefs to create food and cigar tastings. Traditionally, cigars are smoked on a full stomach, therefore after dinner is the preferred time. On an empty stomach medium and full bodied cigars may cause nausea or dizziness. Dessert seems to be the most appropriate time for a pairing. You will need to consider the four Cs; Cognac, coffee, chocolate and cigar. Alcohol based desserts should be considered as an accompaniment to your cigar. A dessert comprised of chocolate, honey, nuts and fruit can also be very successful with your after dinner smoke. It’s all a matter of taste, and trial and error. Bon Appetite!